I'm not a Windows lover to say the least, but lately I'm working on Windows for professional reasons, hopefully not for too long. Being upgraded to Win 7, I must admit that I was surprised in the positive way, but not that I'll replace my Ubuntu. For the simple reason that Windows just annoys me too often (http://bit.ly/LD5WpP). One of the negative surprises was the search function in Explorer. They made it a real piece of crap of it. I must admit that I'm spoiled with the built-in grep function in my Ubuntu and I also admit that my last search operations date from the Windows XP times. The only thing that I wanted to do is search for a word in a specific file-type. So in XP you could easily perform a search on a file type and then look in this result in the content. You even had a search shortcut in the context-menu of a directory. Assumed that this function didn't change that much, oh boy, was I completely wrong about that. I know I know, many would say now, why don't you just install a grep-program? Well I guess I'm just too stubborn... Why install a program to perform an action that I could do in Windows XP and if I'm not mistaken in all XP's predecessors? First of all, Search in context-menu: GONE. Ok, looking for a search box... found it in the top right corner rather fast, since this is similar to the search in some of the popular web browsers. Next look for files, that went pretty smooth, start to search the moment I start entering characters. But this was not what I wanted, I wanted to look for content inside a file, and furthermore content in specific file types. For example I want to look for a word 'parrot', but only in files with file name 'animals.cfg'. Since I didn't find this immediately, I used my best friend Google. Unfortunately even this friend let me down a bit. No satisfying result on the first results page... how is that possible. In the blue bar under the address and search boxes, click Organize and select Folder and search options. Go to the Search tab. In the What to search box, select "Always search file names and contents..."
But of course not the result that I wanted, even when it has to look for content, it only looks for content in the file name. It's getting more and more fun. Now it doesn't even do what they promise. I give up, back to my Ubuntu to quickly find my files of a specific file type, containing a specific word. Wow, that took me 1s to type my command and about 0.16s (ZERO POINT SIXTEEN seconds) to give me the list of files. So dear Microsoft, fix your Search function, document it better, or fix your Search function harder. As technical writer, I should be playing with all kinds of tools, so since WordPress is becoming more and more popular, I'd give it a try. So I installed WordPress on a LAMP stack (as a virtual machine), by following their Famous 5-Minute Install instructions. So all went fine. I used the IP address of my VM to configure my WP database since I don't have a domain name. No problem, I played a bit around with WordPress, tested some configurations, and so on. It really works fine. Unfortunately after restarting my VM, I got another IP address and I was no longer able to connect to my installation. Not in FireFox, not in Chrome. In FF I got to an login window, but in plain text, so no CSS at all. But the most surprising was that both browsers always tried to reach WordPress via my previous IP address. After clearing the cache and cookies of my browsers and restarting Apache on my WordPress server I thought my issue would be solved... wishful thinking that was. Luckily I can trust my dear friend Google. One search query and following the first result got me back in the driving seat. where I change `example.com` by my IP address. Om ons verlengd weekend van 1 mei af te sluiten besloten we (ondertekende met wederhelft en onze twee dochters) om nog eens een hapje te gaan eten op den dijk van Oostduinkerke. Eentje die in ons geheugen zal blijven hangen, helaas in de negatieve zin. Na eerst wat kuieren op de dijk, besloten we uiteindelijk om ons de installeren op het halfopen terras van De Barkentijn. Niet te veel volk op hun terras op het strand, geen volk binnen, enkel nog een ander gezin op het terras aansluitend aan het etablissement. Niet echt druk dus voor een feestdag. Om met de deur in huis te vallen: het is een serieuze tegenvaller geworden. Niet zozeer door het eten. Hiervoor moeten ze niet veel onderdoen voor de andere etablissementen op de dijk. Het eten was okee, niet meer niet minder; de gewone kwaliteit zoals je die op de dijk kan verwachten. Niet echt iets wat we zullen onthouden dus. De service daarentegen zullen we wel nog lang onthouden. Ik denk dat we 3 of 4 mensen van het personeel hebben gezien en allemaal gaven ze ons de indruk dat ze ons liever kwijt dan rijk waren. Het opnemen van het eten en drinken duurde al lang, veel te lang, zeker als je weet dat we minstens 5x gepasseerd zijn geweest door de obers. De wachttijd voor het leveren van eten en drinken was dan weer wel in orde. Helaas was de bediening dat iets minder. Weerom een gezicht dat op onweer stond, een glimlach kon er echt niet af blijkbaar. Toen we uiteindelijk wilden betalen, hebben we 3x teken moeten doen naar de ober, toen die dit de 3de keer zag, konden we duidelijk zien dat het hem niet aanstond dat we de rekening vroegen. Hebben de rekening dan maar aan een andere ober gevraagd. Dit was dan ook niet met de meest hartelijke persoon, maar we waren al tevreden dat hij er snel was met de rekening zodat we snel konden afrekenen om daar zo snel mogelijk buiten te zijn. Mochten we punten mogen geven zoals in 'Komen Eten', zou het voor sfeer en service een dikke nul geweest zijn. Skype on my Ubuntu works fine, despite some configuration issues at installation time, but I was tired of all those windows for each and every chat session and even the list of contacts. Now this is finally over, I have finally a skype version that produces only one window, except when making a call, but I can live with that though. apt-get update and install the package skypetab-ng. 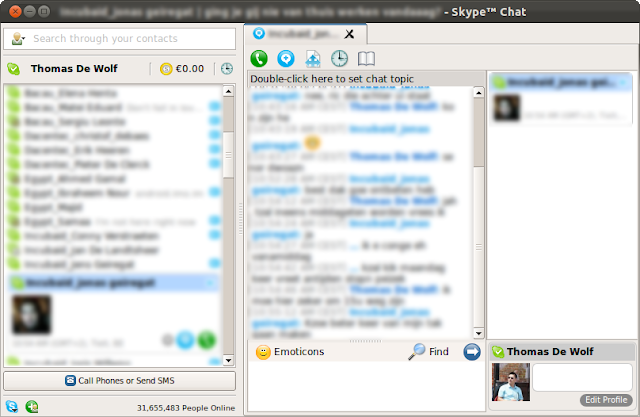 Then instead of launching skype, launch /usr/bin/skypetab-ng! Not sure if it uses the original Skype, but I think so.